Chocolate and raspberry - a match made in heaven in these Raspberry Chocolate Chip Bars. 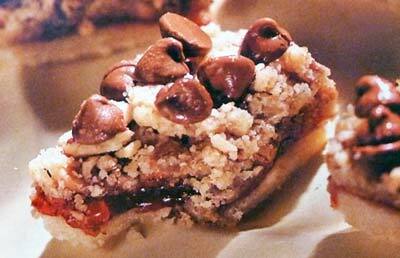 These bars, or squares if you prefer, have a nice crust which is then layered with raspberry jam and topped with crumble topping made with chopped pecans and brown sugar and sprinkled with chocolate chips. Perfect as an after-school snack or as an afternoon treat with coffee, these bars are also easy to make for your company potluck or served to your dinner party guests after an enjoyable meal. We think this recipe would taste great with strawberry jam too! To bring out the best flavor in these cookie bars, be sure to use a high-quality raspberry jam. Preheat the oven to 375F degrees. Grease an 9-inch square baking pan with shortening or non-stick cooking spray. Alternatively, for easy removal and cleanup, line your pan with foil and grease the foil. In a medium bowl combine the 1 1/4 cups flour and 1/2 cup granulated sugar. Cut in 1/2 cup butter with a pastry dough blender until mixture looks like coarse crumbs. Press the crumb mixture into bottom of prepared pan. Bake in preheated oven for 18 to 22 minutes or until crust is set but not brown. Using the same bowl, combine 2/3 cup flour, chopped pecans and brown sugar. Cut in 6 tablespoons butter with pastry blender until mixture is coarse crumbles. Spread jam evenly over hot crust. Sprinkle crumb toppings and chocolate chips over jam layer. Bake for 15 to 20 minutes, at 375F degrees, or until golden brown. Remove from the oven and allow pan to cool completely on wire rack. This recipe makes one 9-inch square pan of Raspberry Chocolate Chip Bars. Would you like to make these bars with other flavors of jam? Go ahead! Have fun! Experiment! Let us know what you discover. We are always on the lookout for new variations of our favorite raspberry chocolate chip bars recipe.